[…] Touch Food’s two CDs were realized in 2001 and 2002. Each of its four compositions uses the sounds of a single musician: Ulrich Krieger, baritone sax; Carol Robinson, clarinets; Kasper T. Toeplitz, electric bass; and Reinhold Friedl, piano. Despite being mostly composed of just one instrument (Robinson used three), these compositions are so abstracted from their sources that you might not know what made them without the credits; the massed saxes sound like a masses of strings laid over organ chords, the basses like the dopplering of passing clarinets, the clarinets like synthesizers. Sweet Potato, the clarinet piece, feels like a real stylistic departure for Phil. The tones move in and out of the mix with a complexity and speed unparalleled in his work. For those unfortunate ones who still haven’t approached the music of Phill Niblock, this could be the perfect entrance door as Touch food, a double CD set, represents a nice selection of facets of the Indiana composer’s vision, all the while adding new perspectives and several fresh perceptions of his (by now famous) wall of droning soundscapes. The power of this music is actively working on every single brain cell, producing a mixture of hypnosis and ear(th)quake depending on the level you listen to it. […] As Sweet Potato introduces itself with a quiet elongated entrance, a fervor is built with collaborator Carol Robinson. Robinson’s tools include clarinets and a basset horn. Here the listener experiences dusk by way of listening, watching, waiting. The music here slows time and looks at the world with a scrutinizing, macro approach. Toying with our consciousness of delayed realism, altering our need for precision and clear linear thinking, this cleans our system of any excess, leaving us hovering. The emotional impact of the sounds is really quite bizarre. I am sure I am supposed to dread or materialize something when listening to this disc. What comes to life is fleeting industry, corrugated manpower, less of the human hand, the human touch in all we do. There is some type of comment embedded that is open discussion for our world in chaos, a world of communication, at war. […] I was introduced to some of the pieces on Touch Food when I finally had the chance to visit one of Phil’s live performances during last years Instal festival in Glasgow. The music was loud (he insists on having his music played back as loud as possible), the screenings large and bright, time seemed to stand still. We, the audience found ourselves lost in a simple and pure unit of hypnotizing beauty. It was certainly one of the greatest performances I’ve ever experienced. Touch Food, his second release on the Touch label holds three compositions for solo baritone sax, electric bass, clarinets on one CD while a 70 (the number of the beast) minutes piece for piano fills up a second. Each piece follows Niblock’s method of having instrumentalists play long held pure tones or – in case of the piano piece, almost static movements which Niblock layers track by track by track to a long, slowly crawling tonal band that allows the frequencies to melt with each other to form a frozen momentum of eternal sound. 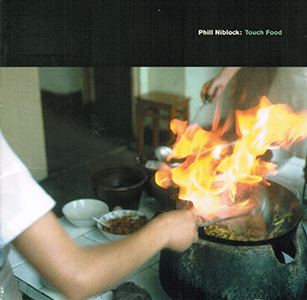 ‘Touch Food’ is an exceptional collection of works by one of the outstanding composers of our time..
[…] At first acquaintance with Touch Food, a double CD collection, each piece seems to consist of his holding a single, albeit multilayered note or chord which ‘goes’ nowhere. It merely hovers for anything up to 20 minutes like some gigantic UFO overhead, before dying away. Once you get inside this music rather than observe it with bemusement, the effect is rapturous and – well, maximal. Niblock achieves his effects through multitracking of live and processed tracks and sampling, all based on original performances on acoustic instruments. He creates an aural illusion of continuity, like the perpetual gush of a waterfall, for instance. In reality, his ingenious layering methods mean that all kinds of infinitesimal but crucial structural and sonic shifts are taking place on a cumulative basis. The naming of the pieces is arbitrary, based on puns on the names of the players or the note they’re played in. Sea Jelly Yellow, based around Ulrich Krieger’s baritone saxophone, is the most dense and seemingly unchanging of these pieces, a formidable challenge for the novice. Sweet Potato, featuring Carol Robinson on bass clarinet, basset horn and Eb clarinet is marginally looser, the variations more tangible, the wavering bass throbs like a solemn chorus of foghorns, or male sirens. Yam Almost May, featuring Kasper Toeplitz on electric bass, lists and lurches like a looped extract from Gavin Bryar’s The Sinking of the Titanic. Press the CD fast-forward button, however, and like one of those time-delay shots of flowers opening and closing, you’ll get a surprising sense of its musical edition. Most awesome of all is Pan-Fried 70, initially intended as a 75 minute piano piece but, because the composer is 70 this year and ‘became a little tired after 70 minutes’, it stops there. Divided up into five segments, it is performed with a single nylon string tied to a single piano string, ‘Stroked with Rosin fingers’. And yet, once processed, its multiple sonic effects, both real and the result of what you might call a trompe l’oreille, are immense, swarming the entire sky like a heavenly host. Niblock recommends you play his music loud, which always seems like cheating to me, but this truly benefits from being cranked up. It’s like the end of the world. Make no mistake: Touch Food is a demanding chunk of sound, and one that repels the kind of hyperspeed channel – surfing mentality that results in all those Kid606 and Donna Summer records. But with patience, the meticulously arranged drones of these two discs unfold into things of wonder.